If your username has been changed, PLEASE do one of the following: • Send me a PM including the date of your granted permission(s) under your old username. OR • If you're requesting a new sprite, inform me of the name change and include the date of permission(s) granted under your old username. Thank you! Hello, Sei! I would like to use a sprite made by PFQ: [b]My pfq.link:[/b] [url][/url] [b]Sprite(s):[/b] [b]Usage:[/b] [b]Who's making the sprite:[/b] Thank you! To find your pfq.link: This can be found on your party page: I need the one I've boxed in - the second one. :) YOUR REQUESTS WILL BE REJECTED IF THEY DO NOT USE THIS FORMAT. This is because I NEED THE SECOND pfq.me link! An example of a filled out forum would look like this: Hello, Sei! 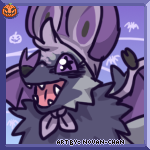 I would like to use a sprite made by PFQ: My pfq.link: [url]https://pfq.link/@s[/url] Sprite(s): Noivern Usage: Recolor Who's making the sprite: AlyssaNights in her [url=URLHERE]shop[/url] Thank you! Please have your shop customer post in this thread - the sprite is for them - they'll be the ones using it around the site, so they're the ones who will need to ask for permission. If you run a shop, please include this (or something similar) in the first post/ rules section of your shop: • If you wish to order a sprite made by the PFQ staff team (Gen 6, Gen 7, all Mega Pokemon, and all exclusives), please use the [url=https://pokefarm.com/forum/thread/4783/Sprite-Permission-Request-Thread/post/844167]Sprite Permission Request Thread[/url] and request for permission to have the sprite edited by me. When making your order, please include a screenshot of Sei granting permission to have me edit the sprite for you. Their post here should look something like this. I'll use Mega Mightyena Q as an example: "Can I please have permission to let [SPRITE SHOP ARTIST] to [TYPE OF EDIT (ie: recolor)] Mega Mightyena Q?" I will then grant permission for the both of you to use the sprite in question. They should then return to you with a screenshot of the permission - if they don't, please feel free to PM me about this! • How many sprites can I get permission for in one post? Due to the formatting of the table, and for the sake of my sanity, a maximum of ten sprites is permitted per post. Any more than that and I'm afraid you'll have to make another post requesting more at a later time. Keep in mind when you say something like "the flarbat line", which includes gender differences, that means it takes up THREE spots - male and female are included since they're the same species.